Received my first batch of Owner Tanago hooks from TanagoBum end of last year, but I only got around to testing them out this past weekend. Went to my usual city spot in Johannesburg to target mini species. I actually wanted to catch a couple of small fish, which looked like they could be either mosquito fish or top minnows. 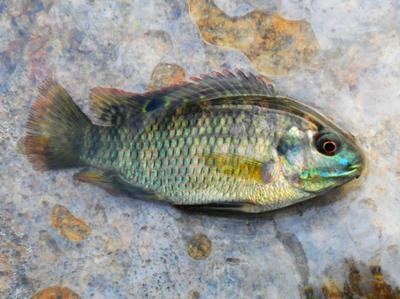 But there were way too many banded tilapia (Tilapia sparrmanii) around for the little ones to get to the hook. Caught a couple of beautiful specimens in the 50mm - 100mm range. My rig consisted of an Owner Tanago hook snelled onto 7X (2.25Lb) Airflo tippet, small splitshot and a tiny speck (roughly 1mm x 1mm) of artificial bait cut from a larger soft plastic grub. I used a combination of a 6'6" spinning rod and a 4 metre telescopic Garbolino Midnight whip (similar to the tenkara/tanago tele poles). Had a great time catching the micro species. More stories to follow soon. That green coloration is awesome. 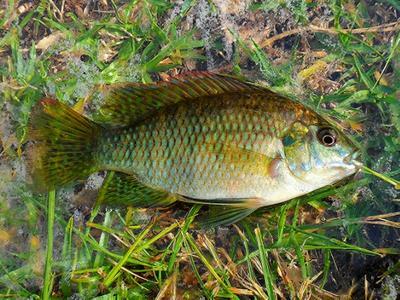 Do they become that vivid of a green color due to spawning or do they retain that same coloration all year long? They retain the colours throughout the year, but their colours do become more vivid during spawning, some even turn completely dark blue to black. The colours also differ from lake to lake. Great post, I love the image of the fish.